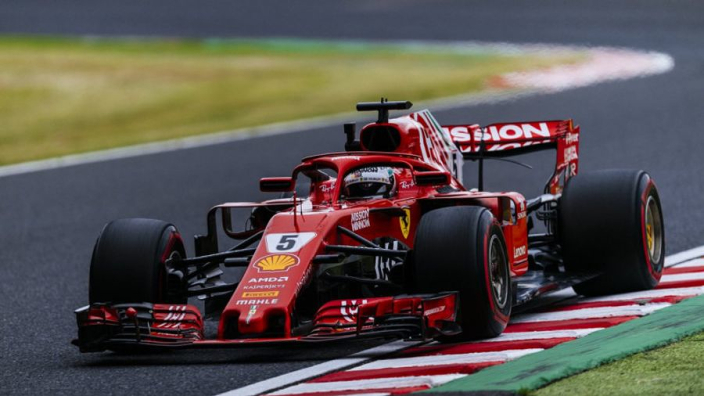 Sebastian Vettel said he deserved more than ninth place on the grid after Ferrari's latest strategic blunder left him a distance off pole-sitting title rival Lewis Hamilton at Suzuka. Vettel clung to the notion that "anything can happen tomorrow" after Ferrari's tyre gamble in Q3 backfired spectacularly. Vettel and Raikkonen merged for Q3 fitted with intermediate tyres, but the track had dried after a brief shower and the pair scurried back to the pits for slicks, all the while Hamilton set his pole lap with a 1:27.760. Once the Ferraris were back on-track, the rain returned and errors at the slippery Spoon Curve cost them – particularly Vettel. Vettel will start the race in eighth thanks to Esteban Ocon picking up a three-place grid penalty for a red-flag infraction in FP3. Having slid out of a certain German GP win and trailed Hamilton in wet qualifying sessions in Hungary and Belgium, Vettel was left to count the cost of more misery in inclement weather. "I think the first run was sort of OK," he said. "Obviously I had a mistake in Spoon so lost most of the time there. "But obviously the second run we didn't make it out on time the because the rain came. "Obviously it's not the position we deserved to be in. I think we have better speed than ninth but we start there and we'll see how it goes. "I think anything can happen tomorrow. Tomorrow's a new day - obviously it's not easy when you start further back but it's not impossible."